I am going through a little phase right now. Basically all I want to make is bowl food. You know what bowl food is right? Noodle bowls, rice bowls, burrito bowls, soup bowls. I am a little bowl obsessed, but geez, bowl foods are fabulous. Ah huh, fabulous. Also, how do you guys feels about soba noodles? This was my first soba noodle experience and to be honest, I am not sure how I feel about them. I mean, the noodles with the dressing, the salmon and roasted veggies were so good, but I had a hard time with the color. They are not that golden white color I am used too. No, they are more like a mix between brown, black and gray. And I was a little freaked. So freaked that I totally thought I bought the wrong kind of soba noodle so I ran to the store to buy another. Well that was obviously a huge waste of time. All soba noodles are buckwheat (I do believe some come half buckwheat half flour and next time I will try to find those) and they are all generally the same color no matter what brand you buy. So I just said to myself either get over the color or reach for my standard angel hair pasta that I use ALL. THE. TIME. Going against basically everything in my body and brain, I actually went for something different for once. I stuck with the buckwheat. My mom is going to be so proud. Although she really, really loves angel hair, so this might be the one time where she wished I would have gone with the usual. Oh well, oh well. The buckwheat was actually really awesome. Totally different, but still awesome. 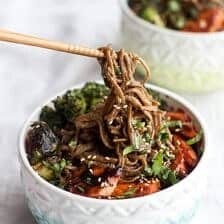 I can’t say that normal noodles would not be delicious with this because they would, and if the soba noodles are not your thing or you cannot find them just use some angel hair or spaghetti, but I like them with these flavors. Plus, they are loaded with fiber, which is really good for us. The one thing I have to mention about the noodle is just be sure to not over cook them. I am pretty sure that I let mine go a minute too long and they were a little bit mushy, so just pay attention them. Apparently, I am easily distracted. Err, that has been apparent for a while and if you were around me for like five minutes you would know that. These bowls come together super quick and are the perfect healthy weeknight meal. Although, I feel that I should mention, I also had to make steak to go a long with these bowls. No one but my dad and I will even come close to fish in my family. Wait, that is not true my brother Brendan loves fish, but he left a few days with his kitten, Pandagucci. Have I told you guys about Pandagucci? Let me just give you a little info. Pandagucci is maybe the world’s cutest little kitten out there. See, Brendan is a weird one. In the snowboarding world he is known as the “Nicest Bad Guy You Will Ever Meet”. He looks a little tough around the edges, but he is a total softy and truly the nicest guy you will ever meet. This was especially proven over Christmas when he just showed up with his new kitten in tow. He took really good care of him too and of course, the cute little kitten was extremely popular. So much so that grown adults were fighting a five-year old to hold him. Pretty funny sight! Originally the cat’s name was Todd, but the family decided that Todd was just not a good name for the kitten. Somehow everyone decided on Pandagucci. No idea how, but it works, and that would be the story of Panagucchi. Seriously, check out how cute he is. I miss him. Anyway, my point was supposed to be (see – easily distracted) that if you are not a salmon eater you can make this meal with steak too, but the hoisin caramelized salmon is better. Add the broccoli and brussels sprouts to a baking sheet. Toss the broccoli and brussels with 2 tablespoons olive oil, the grated or minced garlic and a pinch of salt and pepper. Toss the mixture well to make sure the veggies are completely coated. Roast for 15 minutes and then give them a good toss and roast another 10 minutes or until the veggies are soft and crisp. Remove from the oven and keep warm. Meanwhile combine the sesame oil, tahini, honey, lime zest and lime juice, ginger, soy sauce, crushed red pepper flakes and 2 tablespoons hoisin sauce. Whisk until smooth. Set aside. Now grab the salmon and sprinkle it with a good dose of black pepper. Rub each filet with a tablespoon of just plain hoisin sauce. Add more if the hoisin is not fully coating the salmon. Heat a little a drizzle of olive oil in a large oven-safe skillet over medium heat (do not go above medium heat). When the oil is hot, add the salmon, skin side down in the pan, and cook for about 3-5 minutes, cook 3 minutes if you like your salmon a little underdone. Carefully flip each salmon filet and cook for another 2-3 minutes. If the filets are thick (mine were not) flip to the side and cook each of the sides for another 2 minutes and then carefully flip the salmon so the skin is facing down (meaning the skin should be touching the bottom of the pan). 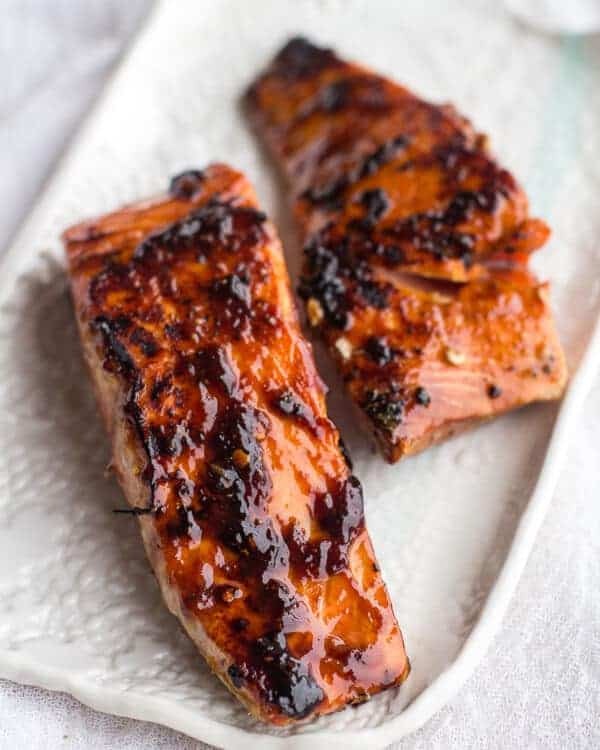 If some of the hoisin mixture has fallen off the salmon rub a little more on the fillets and then sprinkle the top of each salmon filet with a sprinkle of sugar. Transfer the pan from the stovetop into the oven. Let the salmon broil for 5 minutes (10 if you like your salmon a little more done or if you have thick filets), checking often to make sure it’s not burning. Just do not overcook the salmon, if anything undercooking is always better. Remove the salmon from the oven and loosely cover with foil. Toss the warm noodles with half the dressing, roasted veggies, green onions and half of the cilantro. Toss well and add more dressing if desired. I used about 3/4 of the dressing. Divide the noodles among four bowls. Gently peel the skin away from the salmon (it should come right off) and chop into chunks. Top each bowl with chunks of salmon. Garnish with fresh cilantro and toasted sesame seeds. Serve immediately. And now, I believe it is noodle time. Yes! I love noodle bowls! This one sounds phenomenal with the hoisin flavor and the lovely combination of veggies. Also, Pandagucci is adorable! I loveeeee bowl food! 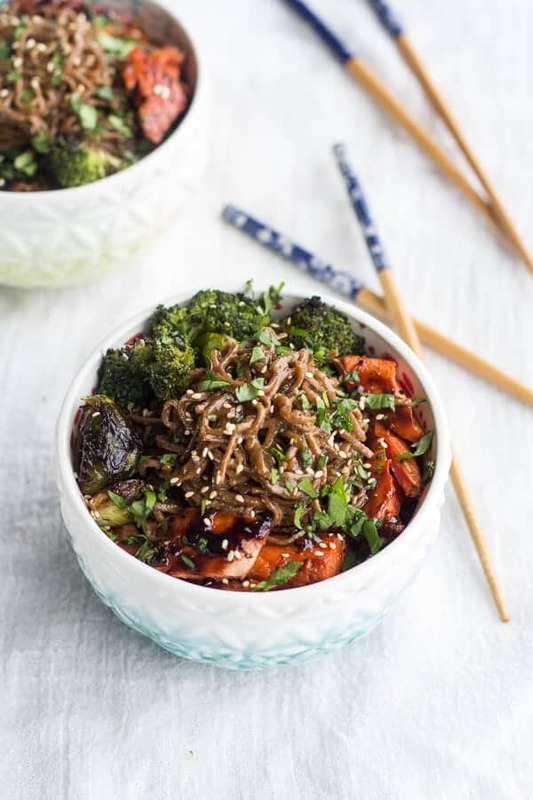 And I love this bowl of delish soba noodles, crunchy veggies and that sweet caramelized salmon! Me and the hubster are ALL about Asian cuisine, and we eat a lot of buckwheat noodles, so this looks right up our alley. Pinned! Thanks Taylor!! More bowl food is coming! Seriously girl, everything you make makes me want to hop a plane and come over for dinner!!! I love soba noodles!! But I totally know what you mean, 30 seconds and they can get overcooked in an instant. I always stop on the relatively early side and then rinse them under cold water, which helps a lot (I never do that with normal pasta though, only soba). So glad you tried them! Love the salmon too! Yum! YA, I totally overcooked them. Oh well, next time!! I love this! I love those bowls too – where are they from? I got the bowls for Christmas, so I have no idea. I will ask though and find out! This is my type of meal!! I love anything Asian – love all of the flavors!! Thank you, Liz! Asian is my favorite! These are beautiful, and sound seriously delicious! 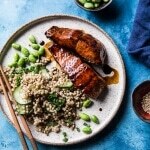 I love Salmon, and hoisin is a fave flavor of mine! These would be a perfect dinner! 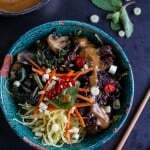 I love bowl food too and this one is right up my alley! Thank you so much, Jeanette! Also thanks for all the sharing you have done of my post!! Hi Tieghan, looking forward to trying yet another wonderful creation of yours. Just wanted to let you know your future home looks amazing! I can picture how beautiful it will look! Can not wait to see the transformation . Hugs and hello to everyone. Thank you so much, Mrs. Kevesdy!! Bowl food sounds delicious! And I’m totally in the mood for salmon right now. P.S. Beautiful bowls. Where did you find them? I Got the bowls for Christmas, but I will try and find out where they are from! I so rarely make anything that goes on a plate… for this exact reason. Bowl food is just so comforting. Can I ask what brand of hoisin you buy? I have bought several different varieties, and they all tasted horrible, which is pretty funny since one of my favorite Chinese meals is mu shu pork or chicken. Loving the sesame flavor you got going on with the noodle bowls! I generally by this brand at my grocery store. We like it! I am in a big food in a bowl phase right now too. It’s such a great way to get a tons of flavors all together, and this bowl looks like a flavor bomb! YUM! Thanks Steph! I am bowl food obsessed! I eat 90% of my food out of bowls, so I’m 200% down to partake in your phase 🙂 This looks freaking amazing! 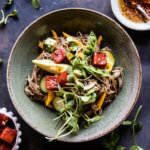 I’m all about hoisin and have been meaning to try soba noodles forever. Hope you had a lovely weekend, lady! Bowl food rules!! Love it! I’m really liking the term “bowl food.” This bowl o’ food look absolutely yummy. Oh goodness. All my favourite things. In one little bowl. Looks heavenly. I love you so much for sharing this recipe Tieghan! 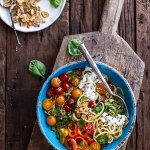 This recipe is soo unique and healthy! I’m sure it tastes amazing! I’m going to run to the fish market and make this for dinner! I want to dive into the pan of broccoli and sprouts! This looks pretty scrumptious. Wow the roasted broccoli looks good in and of itself! Can’t imagine how good this tastes all together =) yum! I could really go for a big bowl of this after our weekend of gluttony! Looks delish! Thanks Lauren! Where you guys up here over the weekend? There’s something about bowl food that makes it super comforting. 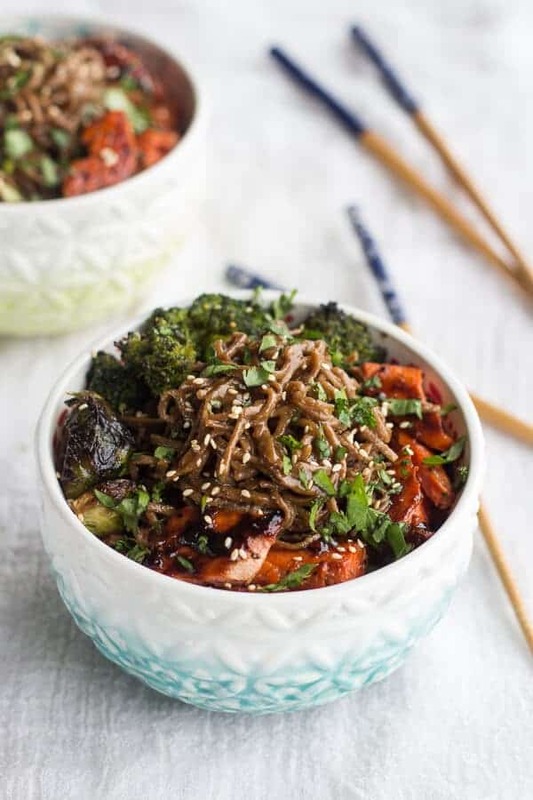 I’m a huge fan of soba noodles…..especially when combined with all the amazing ingredients in this bowl! P.S. Those bowls are so cute! Thank you so much, Kelli!! Looks great, Tieghan! I love salmon prepared like this. Mix it with those noodles and awesome veggies and you’ve got one great meal! Need this on the menu right away! Just gorgeous. Um, yum! 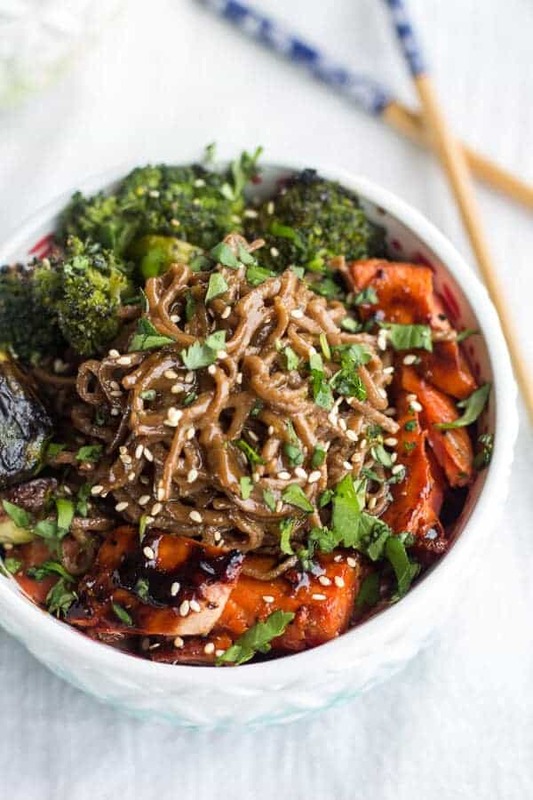 I use soba noodles all the time to make this dish http://www.thecurvycarrot.com/2013/07/05/spicy-soba-noodles-with-peanut-sauce/ not sure how you feel about tofu, but we have this meal at least once a month! I love “bowl” foods because they look delicious and are great for families because they are easily customizable. I would love if you did a Mexican type bowl, we don’t have a Chipotle here, but I adore their bean bowls! Thanks Karley!! I love the peanut sauce noodles!! I am drooling..I bought a bottle of hoisin jar long time ago..now I know what to do. thanks for sharing this bowl, I am little bowl obsessed too. Thanks Dixya! Hope you love this! Yay, for noodle bowls! Love the addition of the salmon, can’t get enough of it! I don’t eat meat (or fish) but what stopped me was the brussels sprouts and broccoli! It look delicious! Thank you, Kira!! This bowl is still totally awesome with just the veggies! I love brussels and broccoli! First of all, Pandagucci is such a cute kitten! 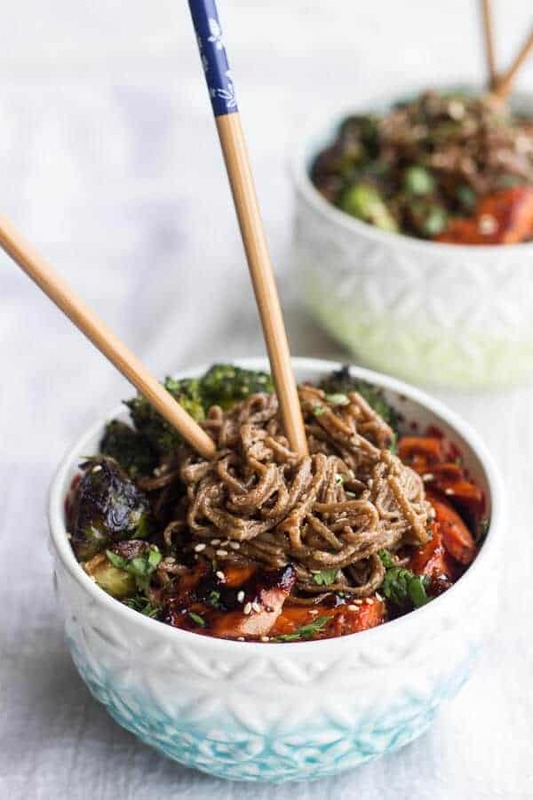 This bowl meal looks so delicious, and I totally get you on the colour of the noodles but I think I’ve had them before and they were good! The caramelised salmon is my favourite part! Thank you so much, Paula!! So beautiful. Love all the colors and flavors going on. Thank you so much, Breda! I was nervous about the noodles, but they turned out pretty good! That is one glorious noodle bowl. I love the combination of broccoli and sprouts. Thanks Shaina! The broccoli and brussels are probably my favorite part! I must agree! And wow, this is one delicious bowl! We just bought some lovely bowls for udon soup, but I think they’ll do well for these soba noodles too! Thank you for sharing! THANKS!! Hope you guys loves these noodles! Thanks Nicole! The soba noodles scared me, but they turned out great! Tieghan, this dish looks outrageously delicious. I could eat bowl food all day every day, especially if it’s full of soba noodles. I bet brussels and salmon are incredible together. I’ve also found that it is easy to overcook soba noodles—the trick is to boil a lot of water (more than I would usually boil for an equivalent amount of regular pasta), drain as soon as the noodles are tender, and rinse under cool water. Yeah, I totally let them go to long and did not rinse. They were a little mushy, so I am exited to try making them again! I fully support your bowl food trend! When it comes to bowls of pasta, bowls of cereal, bowls of soup or bowls of ice cream, I’m always all for it! And I also fully support that amazing medley of broc and brussels sprouts going into these awesome bowls. On second thought, can you maybe ditch the bowl food trend and graduate to “trough food trend.”? Bowl food is honestly the best and now that I think about it my post tomorrow is bowl food!! I’m with you on the soba noodles- not my fave. 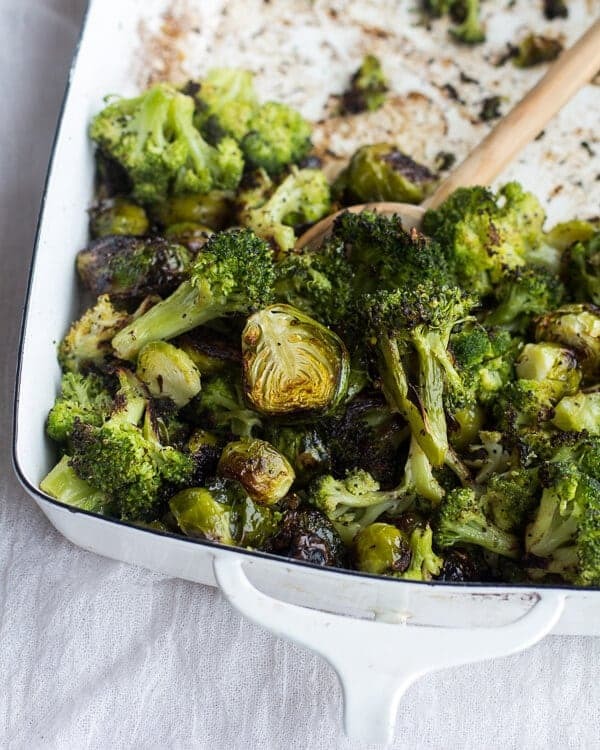 That pan of roasted broccoli and cauliflower is an entirely different story. Give me a fork and I’m good to go! Haha! I know, they still freak me out a little! 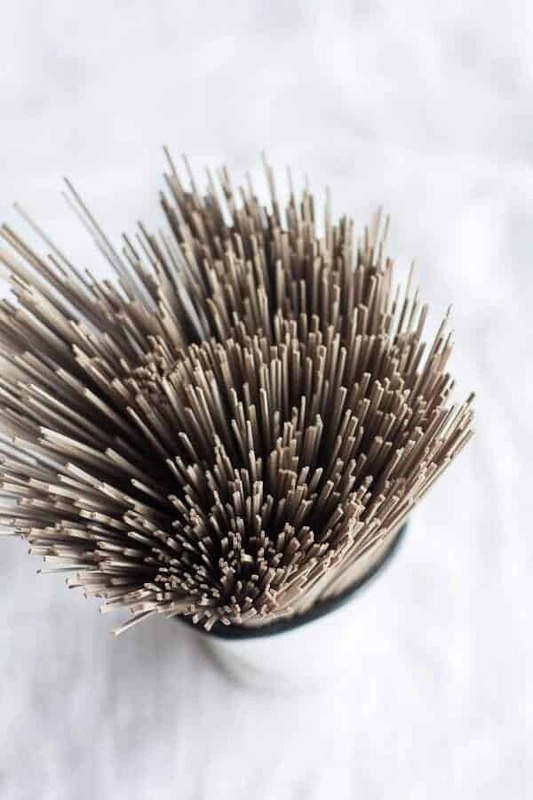 I love soba noodles, what a killer bowl! Thank you, Laura! I was a little skeptical of the noodles, but they turned out great! 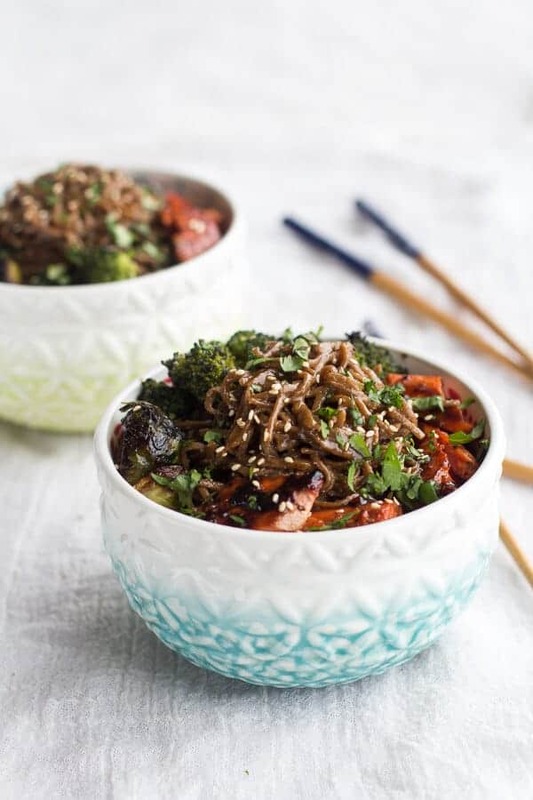 You can never go wrong with a noodle bowl! This one looks delish. I am totally good with lots of bowl food, especially this one. It looks fantastic!! 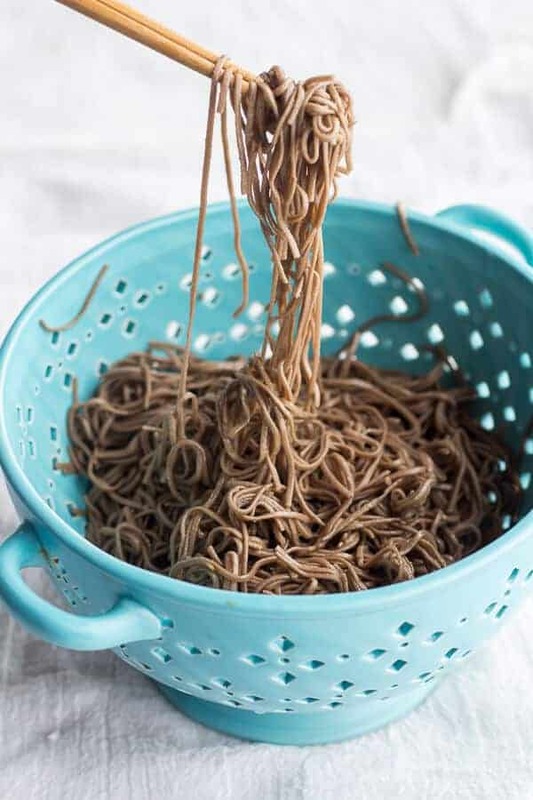 If you rinsed your noodles with cold water (in the colander) it would stop the cooking process and make them not as gummy. I’ve made this twice in the past couple of weeks, and it is sooo good! Love the sauce, and it’s such a quick and easy way to cook salmon. YAY! So happy you love this! Thanks! Yum. Did I say yum? Because I meant YUM!! Just made this for our dinner and holy cow was it good! We love bowl food, too! I will definitely be making this one again! YA!! So happy you love this meal! Thanks for making it! I just finished making this recipe and let me tell you, it was awesome! 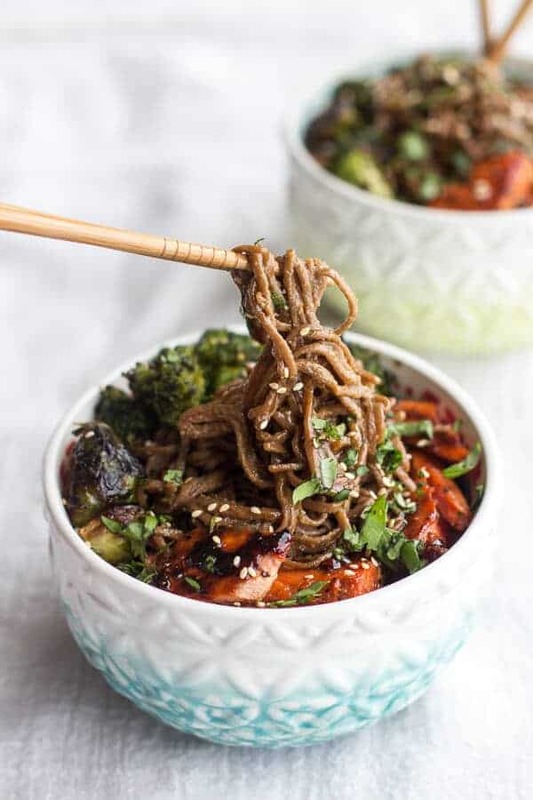 I’ve recently discovered soba noodles and this best recipe I’ve found. p.s.- you can make a snack size version of it without the vegetables and it’s just as great. So happy you enjoyed this meal!! Thanks Jasmine! Eating this as I type. Great recipe and directions. Nailed cooking times and flavors are great. Skin fell of the fish as I pulled it off the pan and went straight to the plate. Hope to see more like this. P.S. Don’t be scared of soba noodles no matter how weird they look. They make for some awesome recipes. Especially hot summer day meals. Hey Alice! I think you could eat it warmed or cold. I would eat it warm, but this is only because I really do not love cold foods. This was great! I used some pre-cooked rice noodles from the product section, but definitely hope to make it again with soba noodles. Can’t wait to make this again! Even without salmon it would be such a comforting dinner. THANK YOU! So happy you enjoyed it. Thanks! Made this last night! Soba noodles came out perfectly. I did make the salmon with the original pinch of yum caramelization method– sugar and salt on all sides then fried in light olive oil. Then I brushed on the hoisin for the broiling part. My dad didn’t want me to muck up the cast iron skillet with super sticky hoisin, as we don’t wash it. I also used 1 tsp of sambal in the sauce instead of crushed red pepper. It worked really well! Everyone loved it, and my family keeps asking me “when are you making a recipe from that website again?” After several months of making various things, I now have to keep “margaret’s weird asian sauce collection” in the door racks of the drinks fridge as I have run out of room in the main one. So happy this was a hit, thanks!! I just have to tell you, this dish is epic! I have made it several times. And every time I make it I revel again at how amazing it is! The steak i’m sure was delicious! Thanks Jamieanne! This was really tasty and came together in no time! Was looking for something on the healthy side that involved salmon so I made this tonight for dinner. A few things: I only roasted the veggies for about 15 minutes (turning at around 10) because my broccoli was starting to burn. Also, I halved the dressing recipe because I was low on sesame oil) and still had plenty! Finally: I have a question- and this is the reason I shy away from doing my salmon in the pan even though its delicious- my skin always sticks!!!! Am I not waiting for the oil to get hot enough? I heard a sizzle when i placed it down so I figured I was okay, but then spent the next 3 minutes frantically scraping salmon skin off the skillet while the other side cooked. Help! Anyway, the dish was absolutely delicious. LOVED it and will be putting it on the regular rotation. Thank you!!!!! !